Tips & Tricks- iPhone Secrets is perfect for every iPhone, iPod touch and iPad owner out there who wants to get the most out of the convenience of their Apple product. This app shares 141 tips and tricks for how to do everything from conserving battery life to locating a lost phone to avoiding those embarrassing text messages that pop up on the home screen. For people who haven’t yet figured out all the convenient tricks their phone has to offer or don’t want to take the time to search through their phone to learn these tricks, this app will be an indispensable guide. The app is set up like a book, complete with chapters and a somewhat annoying page turning sound that plays each time you swipe your finger across the screen to ‘turn the page.’ The chapter set up makes it easy for the user to navigate to specific sections and tips by quickly scrolling up and down the Chapters screen page. Otherwise, the user can just just flip through the tips in numerical order screen by screen. The chapter pictures are of great quality and showcase the quality pictures that can be taken with the phone. Each tip or trick is accompanied with a picture of the portion of the iPhone screen to which the tip is referring. The tips are easy to read and written in simple to comprehend language. The pictures on each page are also helpful in visually explaining what the trick would look like on the screen. Most importantly, the information provided is comprehensive and covers a wide range of ways in which the user can use their phone more efficiently or cool tricks like using the phone as a microphone. For those with the newer iPhone 4 and 5 versions, there are tricks listed specifically for those newer products, including a chapter solely devoted to SIRI. Although the chapters are easy to navigate, the app would benefit from a search option to allow for an even faster location of tips. 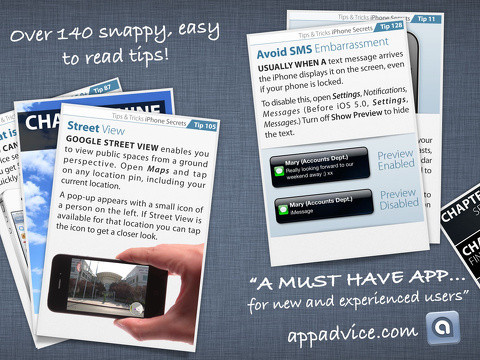 One of the app’s best features is that it allows the user to share tips with their friends. By hitting the ‘Share Tip’ icon in the bottom right-hand corner of each chapter or tip page, the user can share tips by email or through Twitter and Facebook accounts just by signing in. After the user signs in, the tip will automatically post on the user’s social media page. If the tip is sent by email, a default message automatically displays in the email body and the message will be sent from the primary email account signed into on the phone. At only 99 cents, Tips & Tricks- iPhone Secrets from Intelligenti Ltd is a cheap and quick way to learn how to get the most out of the iPhone device. 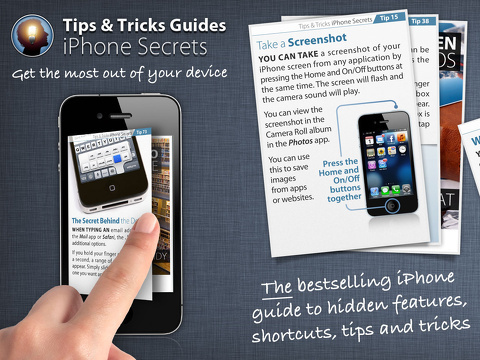 AppSafari review of Tips & Tricks – iPhone Secrets was written by Sally Pope on July 31st, 2012 and categorized under App Store, iPad apps, Productivity, Reference, Universal. Page viewed 4130 times, 1 so far today. Need help on using these apps? Please read the Help Page.